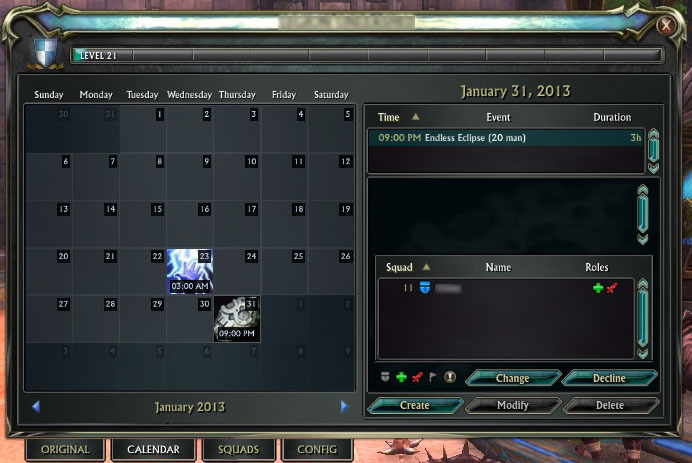 BiS Calendar is an ingame guild calendar addon for RIFT that is seemlessly integrated into your existing guild window. It'll allow your guild to set up events, and optionally post them to the guild wall so those not using it can be aware of incoming events too. Your guildies will be able to see the events, adjusted to their local timezone, and join / leave them at will, indicating which roles they can fulfill. Whether you're a serious raiding guild, a bunch of bloodthirsty pvpers or just a group of friends having fun together, this addon will help your guild to plan and organize better your group activities. Set guild settings / Assign squads: Requires "Officer chat", "Write to Guild Addon Storage", "Delete from Guild Addon Storage"
Create events: Requires "Write to Guild Addon Storage" and "Post to Guild Wall"
Modify own events: Requires "Write to Guild Addon Storage", "Delete from Guild Addon Storage" and "Post to Guild Wall"
Modify others' events: Requires "Write to Guild Addon Storage", "Delete from Guild Addon Storage", "Post to Guild Wall" and "Delete Guild Walls Posts"
Delete own events: Requires "Delete from Guild Addon Storage"
Delete others' events: Requires "Delete from Guild Addon Storage" and "Delete Guild Walls Posts"
Join / Decline events: Requires "Write to Guild Addon Storage", "Delete from Guild Addon Storage" and being assigned to a squad. Hello people since it didn't receive any updates, i basically added new raids irotp, tdnm and bos to the addon and shared it on rift forums, you can find updated one from here: http://forums.riftgame.com/technical-discussions/addons-macros-ui/500226-addon-updated-biscal-4-3-a-new-post.html, it would be good if any of the authors here can update the file with the one i updated too. TD T1 and iRotP need added. The problem with different versions is that they're not going to have the full list of raid options, so if they're using 5.1xxx and you're on a higher version and add (for example) CoA, they're going to have undefined index errors since the raid that's in the system isn't in theirs. Having everyone in the guild on the same version is actually quite important. Especially if someone is using an alternate version that has defined raids differently (I know of at least one out there that has completely re-indexed the raid list). I'm glad it's working for at least some of you and I will continue to see what I can do in terms of sanity checking the data that's coming in from storage. Trion known issue with Guild: Target Not in Your Guild. Started in Oct 2015, still un-resolved. We currently have 3 characters with this issue in our guild. We can't promote, kick or add Officer Notes to these characters. I do not know if it has anything to do with the BiS Calendar problems we are having, but it's definitely something funky with the guild dataset. Server-Side Storage. Using Storage Viewer I determined that there was nothing in the Guild Addon Storage except a few BisCal entries. I did delete these for a fresh start. Last week even deleting the BisCal addon folder and doing a fresh install I could not get BisCal to work after my initial try (may 19th post). This week I deleted the BisCal addon folder, did a fresh install of v0.5.145 then updated to v0.6.0 and then v0.6.1 and it's working fine for me, personally. I was able to add, edit events and squads in all 3 versions. Other than a graphical glitch that (1) doesn't open the calendar the first time you use the "G" key then Calendar. Use the G key the 2nd time and the calendar will come up. (2) sometimes the addon tabs (Original, Calendar, Squads, Config) appear at the top of the screen (centered or top left), sometimes on the right side, middle of the screen. This is on all 3 versions. Our Raid Leader has only been able to get v.0.5.145 version to work. He even tried the delete/reinstall process I did above, but it kept crashing him. So he deleted and went back to 5.145 version. This time, he was able to get it to work w/o crashes. He is also experiencing the graphical glitch. Another officer (Frak) installed the lastest version from curse.com and it's working fine for her. (not sure on the graphical glitch with her). I've asked a few other officers to try and will update their results. We used to use it all the time before it broke. I do not know if anyone used an alternate version, I've been gone a while and recently came back, but I have asked and will update if I have new info on that. I did check the guild wall and deleted the event I'd created earlier. There was only one other BiS event on there, extremely old, and I deleted it as well. Unfortunately, I was still unable to log in with BiS active. The only other issue I do know about is we have a couple of members we are unable to add an Officer Note to - some know issue with Trion - in the guild. I have no idea if this would be part of this issue or not, but it could have something to do with a mismatched index. Or at the very list something buggy with this guild dataset on Trion's side. The first of these has a joined date in Oct 2015 but I'm not sure when the problem started. I'll ask about this again later tonight as I don't remember the rest of the details on it. Is there a way to view or manage the Guild Addon Storage outside of Bis Calendar? What other addons use the Guild Addon Storage? Or is there an easy way to find out? Thanks, that's helpful. Can you tell me if your guild ever had an alternate version stored before? I think it may have more to do with the data stored on the Trion server with mismatched index values for the guild than anything local to your machine. I will look into adding some sanity checking on the storage read logic. I have not gotten any error reports since v0.6.1 released, not sure if there's just a delay going on. I tried completely removing the add-on by deleting the folder and doing a fresh download and install. I did this also for the version right before it and also didn't work. This morning I tried again, and it's crashing so i was sure to send info to trion and restart a couple of times. Hopefully, they forward that info to you. Sure, what information would you like? Can you send me anything about your setup? There are a few reports like this, but nothing with enough information for me to track down what might be happening, and no error report from Trion. Feel free to send it via PM so it's not public if you prefer. v0.6.1 - It worked initially but after adding a raid and couple of role assignments, I re-logged on and it began crashing. I had to disable it to log back into Rift. I'm not getting any error reports from Rift on this - only from a version that someone else has posted "RusichiEdition". Can you confirm that it's the current version that's causing you issues? Was there a previous alternate version saved for your guild, or any other information that you might be able to provide about what's going on? It is working properly for everyone that I've spoken to in game, so it's very hard for me to figure out what may be going wrong specific to your guild without more information. Myself and my guild are still suffering from the same problem of this addon crashing Rift. We are all currently using an earlier version which works fine. Will you be fixing this any time soon? We complete removed the addon and rift works just fine, as well as it works just fine when disabled, only when the addon is enabled does the game crash. If you completely removed the add on, and it's still crashing, it shouldn't be the calendar that's causing the problem. If the add on is still present, disable it before entering the world from the character selection screen if your characters are in a guild that does not currently use BiSCal. Please let me know if you continue to experience this problem. Hello, me and my friend have been experiencing an error that wont let us load rift with the addon active, rift gets to 100% load screen then crashes, we have tryed completely removing the addon and all of its files from our computers and running a new installation and still the same problem, the error says rift has encountered and error, error handler. Thanks so much for the updated files Luthermom!!! I don't know that the original creators are maintaining this, but I've cloned and updated it for 3.0 NMT. Hopefully they'll update and merge in the changes. Is there going to be updates to your addon to included 3.0 Content Activities? Raids/Rifts/Etc.? I am really happy from amazing and quick response from various countries, i think all credit goes to our online working team for great contribution and providing accounting assignment help online as well. We have to find some unique ways to increase its process and traffic as well for that purpose we are looking for some experienced workers.